For other places with the same name, see Seville (disambiguation). Seville (Spanish: Sevilla) Andalucia's capital. With more than 700,000 inhabitants, and 1.6 million in the metropolitan area, it is Spain's fourth city, dominating southern Spain. With heritage from the Arabs and from the Age of Discovery, as well as the flamenco scene, Seville is a diverse destination. The smooth, slow Guadalquivir River flows through Seville, known as Betis by the Romans and as Betik Wahd-Al-Khabir by the Arabs. Since it is hard to navigate upstream from Seville, the cereal-producing region starts here, and Seville has been a busy port from Roman times, under Muslim rule, and exploding during the Age of Discovery. As the monopoly was broken and Cádiz largely took Seville's place, the city entered a period of relative decline. Sevilla International Airport (SVQ IATA) is about 25 minutes drive from the city center. A bus service "Especial Aeropuerto (EA)" runs about every 30 minutes from just outside the "Arrivals" hall during most of the day (though with longer gaps from 13:00-16:00) and costs €4.00. Taxis are always available next to the bus stop and run on a fixed fare to Seville center, €22 during the day and €25 after 22:00 and on weekends/holidays. Much controversy has been stirred by some taxi drivers trying to overcharge tourists, so be careful to pay no more than this if you are traveling into the city. Other destinations outside Seville obviously cost more and are metered. Tips are not necessary, though €1-2 for polite, helpful service is appreciated. Speed limits seem to be considered as kind of minimum speed by most taxi drivers. La Parra International Airport (XRY IATA) is 10 km from Jerez de la Frontera, on the way to Seville. This airport is in a nearby city, and is used by discount airlines such as Ryanair (from Frankfurt-Hahn London-Stansted). The communication between Jerez de la Frontera and Seville is good, as it is connected by bus and train. It is also possible to go by taxi or rent car. Ryanair also flies to Sevilla International Airport, from more destinations than Jerez. High-speed AVE trains are great if time is of the essence, less than an hour from the wonderful city of Córdoba, less than three hours run from Madrid to Seville. However, slower RENFE trains remain a bargain, and there is an overnight train that runs from Barcelona to Seville in under 11 hours. 37.39231-5.97521 Estación de Sevilla-Santa Justa (Sevilla Santa Justa Station), Avda Kansas City, ☎ +34 902 432 343. M-F 04:30-00:30, Sa Su and holidays 05:15-00:30. On the eastern edge of Seville city centre. Completed in 1991, the station is the southern terminus of the Spanish high-speed AVE train service. Has luggage lockers, cafés, and a tourist information centre. Santa Justa also serves many of the principal stations in Andalucia, including 'Media Distancia' trains to Cadiz, Jaén, and Malaga. Driving is also always an option for long distance travel in Spain, but isn't as convenient or as useful once in town. Public transportation works fine in the city, and most of the main tourist points are located in a walk distance, so it is recommended finding a lodging with a garage or else researching the area for parking places before the trip. Driving in the old city is tricky but possible. There is a 45-minute limit on cars entering the old city M-Sa 08:00 and 22:00. It is enforced by license plate scanners placed at entrances to the old city. There is a €200 fine for exceeding this limit. Your rental company will be sure to tack on its €50 processing charge, not to mention the late fees that will accumulate due to the time it till take to receive the citation in your home country. There is very cheap parking available across the street from Av. de Málaga, 12. The lot is unguarded and if there is not agent in the booth then the entrance to the lot is free of charge. Do not give money to the panhandlers loitering outside pretending they are lot attendants. If they have not receipt to give you then its a scam. Be sure leave absolutely nothing in the car. Seville in general is known for car break-ins. Another very common option is using carpooling such as BlaBlaCar, a safe transportation method used by many locals. The Spanish bus service is amazingly punctual and comfortable with most having air-con and a toilet. Getting to Seville from other cities in Spain can sometimes be only minimally longer than train (but much cheaper). Check out your options first with the helpful Information desk you will find inside any terminal. The buses run regularly to/from most major cities, departing either from the 37.3918-6.00382 Plaza de Armas bus station near the river, or the 37.38053-5.986173 Prado de San Sebastián bus station near the University/Santa Cruz. Sometimes the queue for buying ticket from the ticket office on a busy day might take up to 20 minutes or more. One way is about 1hr 45min, costs €5.58. One way is about 1hr 15min, costs €9. Sevilla has a great public transportation system. Metro follows a 18 km reverse U from the south-west to the south-east through the southern end of the city centre where it stops at Plaza de Cuba, Prado de San Sebastian and San Bernardo. Tickets are €1.30 for a single zone or €4.50 for all 3 zones unlimited trips, and the metro runs from 06:30-23:00 on weekdays, and late departures are available on Fridays and Saturdays until 02:00. However, there are no stops in old town (where every main tourist site is), and few even near it. Thus meaning it's possible a tourist, may not find use for the metro at all. Buses run frequently and cover the majority of the city in their routes. You can purchase bus cards at many news stands. Trips cost 60c or 70c, and it costs €1.50 to buy a refillable bus card (which can be topped up at many newsstands). A tram system is being incorporated into Seville's local transportation and is running from the San Bernardo Train Station to the Plaza Nueva but is expanding north and west into Triana. Sevici bikes. Seville has a system of automated bike rentals with stations all over town. You pay €10 for the week, and can use any bike that's available. You drop it off at the station nearest to where you're going. Once you're registered, trips of 30 minutes or less are free. If you go over 30 minutes, it's €1 for the 1st hour, €2 for each additional hour. Seville is building many bike paths: one pleasant route covers most of the east bank of the river. Scooters are available for rent for €30 for the day and €120 for the week. These are a cost-efficient way of getting around and a driver's license is not necessary. Taxis are easily accessible throughout the city. Many offer decent rates, but some cabbies are crooked. Walking. This may be the best, general option for most reasonably fit tourists - though Seville itself is fairly large, the older core - where the vast majority of tourists spend their entire stay, is not. Further, while walking from one place to another you will be surprised by the number of beautiful churches, charming cafes and pretty squares that are hiding in the streets of Seville, and are part of the experience of Seville. Cruises, an hour in duration, leave from beneath the Torre del Oro and travel a circuit on the Guadalquivir river. Horse-drawn carriage rides found near the cathedral take you to the nearby park and other sites of interest. For the sake of the animals, try to avoid carriage rides in the heat of the day in summer. The Sevilla Card is designed to aid city exploration and save you money. The card includes free admission to most Seville museums and monuments, unlimited use of public transportation (TUSSAM Buslines, but only for Cards with Public Transport), a guided visit of the Real Alcazar of Seville, unlimited use of sightseeing buses, boat rides on the Guadalquivir river and admission to the Isla Mágica Theme Park. The card also allows access to significant discounts in shops, restaurants, shows and leisure centres for adults and children. The Sevilla Card is accompanied by a guide and city map. However, the Sevilla Card cannot be used for trams and buses. The Sevilla card comes in three denominations of 1, 2 or 3 days’ duration in blocks of 24 hours from the time of first activation when inserted into the electronic validation terminal of the suppliers associated with the Sevilla Card Programme (be careful not to activate too soon). Prices: 1 day €50 (with transport €53), 2 days €60 (with transport €66), 3 days €65 (with transport €72). The 2- and 3-day options attract a discount of €3 per card when purchased on the website. The Sevilla Card can be purchased by the following means: ; by telephone +34 91 600 21 21 / 902 088 908; and, once in Seville, at tourism offices, the airport, the train station, travel agencies and through national and international tour operators (check the website for addresses). A less expensive version, the Sevilla Card Cultura, is valid only for museums (1 day €28, 2 days €32, 3 days €36). 5% less if purchased online. If you are want to use the local buses , you can get either pay the €1.40 single fare price or you can purchase a bonobus, a 10-trip travel card. Bonobuses are found at most kiosks and tabacarias (tobacco shops). Regular times are kept until around 23:30, after which night buses run, with different routes, on the hour until 02:00. 37.38592-5.993111 Cathedral of Seville (Catedral de Sevilla), Avenida de la Constitución, ☎ +34 902 09 96 92, e-mail: info@catedraldesevilla.es. Jul-Aug M 09:30-14:30, Tu-Sa 09:30-14:00, Su 14:30-18:00; Sep-Jun M 11:00-15:30, Tu-Sa 11:00-17:00, Su 14:30-18:00. Once judged the third largest church in the world after Saint Peter's in Rome and Saint Paul's in London, this is now the largest church in the world by volume. The 15th-century cathedral occupies the site of the former great mosque built in the late twelfth century. The central nave rises to an awesome 37 m over a total area of 11,520 m². The cathedral is the final resting place of the remains of Christopher Columbus. Buy tickets at the nearby Church of Salvador (Iglesia del Salvador), where you can buy the tickets for Salvador and Cathedral+Giralda. You will save yourself the long queues and visit another amazing church. €8 (adults), €4 (seniors/youth under 25), free (residents). 37.38614-5.992382 La Giralda. A large and beautiful minaret tower built for the chief mosque, it is now the magnificent bell tower of the cathedral and a symbol of Seville. Climb the 34 ramps for a great view of the city. Admission included with entry for cathedral. 37.38447-5.992143 Real Alcázar, Plaza del Triunfo (entrance), ☎ +34 954 50 23 24. Apr-Sep daily 09:30-19:00, Oct-Mar daily 09:30-17:00. A beautiful palace in Mudéjar (Moorish) style, built in the 14th century by Pedro I the Cruel. With its myriad rooms, extravagant architecture, lavish gardens with many courtyards, ponds and secrets to be explored, it is a fascinating place to visit. Be sure to check out the room where Christopher Columbus's journey to the Americas were planned. You can see his coat of arms embroidered on the wall along with many other royals. In the heat of summer it offers a cool retreat from the suns glare and can quite easily keep you occupied for a few centuries, if not all of your life. During high season it is advisable to make reservations in advance; tickets can be purchased online. €9.50 (adults), €2 (seniors/students 17-25), free (disabled/residents/children under 16). Royal Apartments (Palacio Real Alto). Tours daily every half-hour from 10:00-13:30. Still used by the royal family on official visits and open to tours when not in use. €4.50. 37.394782-5.9893864 Palacio de Las Dueñas (Las Duenas Palace), Calle Dueñas 5 (in the Historical Center near Las Setas), ☎ +34 95 421 48 28, e-mail: info@lasduenas.es. Apr-Sep: M-Sa 10:00-20:00; Oct-Mar: M-Sa 10:00-18:00. Las Dueñas is a palace belonging to the House of Alba. It was built in the 15th century, with Renaissance architecture style and Gothic-Mudejar influences. The palace is one of the major historic homes in the city. The poet Antonio Machado was born here in 1875. It is also said that Amerigo Vespucci married in this chapel at the beginning of the 16th century. The Palace has a great collection of paintings (Ribera, Luca Giordano, Neri de Bicci), ceramics, antique furniture and other decorative arts, sculptures of Ancient Rome and contemporary (Mariano Benlluire), Flemish tapestries (Willem de Pannemaker), mosaics, and many other pieces of art. An important site for understanding Andalusian customs and history. Fee: €10 with audio guide, ask for reduced prices. 37.38511-5.989865 Hospital de los Venerables (Diego Velázquez Research Centre), Plaza de los Venerables 8 (in the Barrio Santa Cruz), ☎ +34 95 456 26 96, fax: +34 95 456 45 95, e-mail: focus@abengoa.com. M-F 10:00-14:00, 16:00-20:00. A 17th-century retirement home and hospital for aged and sickly retired priests, restored by the Fundación to preserve an example of Andalusian architecture at its very best. Includes a resplendent Baroque chapel which is highly recommended, as well as the Santa Rufina painted by Diego Velázquez. €4.75 with audio guide. 37.385-5.990277786 Barrio Santa Cruz (Jewish Quarter) (around the cathedral). Filled with small, winding streets and is generally regarded as the most charming part of the city, but it is also fairly touristy. 37.38245-5.996317 Torre del Oro (Tower of Gold), Paseo de Cristóbal Colón, ☎ +34 954 22 24 19. M-F 09:30-18:45, Sa Su 10:30-18:45; holidays closed. A 13th-century tower, the top of which is rumored to have once been covered in gold. It now houses the local maritime museum. €3 (adults), €1.50 (seniors/students/children 6-14), free (children under 6); €2 for audioguide. 37.37415-5.98818 Parque María Luisa (near the Plaza de España). Built for the 1929 Iber-Americano World's Fair and now landscaped with attractive monuments and museums. 37.37712-5.986959 Plaza de España. The site of the Spanish pavilion from the 1929 exhibition. It was also used in the filming of the new Star Wars episodes. It is somewhat in need of repair. Visit it early in the morning on a weekday to see a long line of immigrants outside one of the government offices it now houses, or visit it right before it closes (officially at 22:00 but likely half an hour later) to see it completely empty and rather eerie. 37.380789-5.9908410 Real Fábrica de Tabacos (Universidad de Sevilla), Calle San Fernando, 4, ☎ +34 954 55 10 00. During term time only: M-F 10:00-20:00, Sa 10:00-14:00. The main building of the University of Seville was once the Tobacco Factory of Seville, and was constructed between 1728 and 1771 by Sebastián Van der Bocht. Over the main entrance, the triangular façade ends in a statue of La Fama (fame). The tobacco factory was then the largest industrial building in Spain. A monopoly assured high income, which is reflected in the factory's architecture and surrounding gardens. Its chapel and prison complement the main building. In the interior you find impressive stairways, fountains and Patios. It was the setting for the first act of Bizet's opera Carmen. In 1953 the factory was converted into the main building of Seville University. Just behind the tobacco factory, the María Luisa Park borders the historic center of Seville to the south. Free. 37.39216-5.9937211 Palacio de la Condesa de Lebrija (Palace of the Countess of Lebrija), Calle Cuna, 8, ☎ +34 954 22 78 02, fax: +34 954 50 10 29. M-F 10:30-19:30 (Jul Aug 09:00-15:00), Sa 10:00-19:00 (Jul Aug 10:00-14:00), Su 10:00-14:00 (Jul Aug closed). The palace is considered the 'best paved house-palace in Europe' owing to its collection of Roman mosaics, which paved practically the whole of the ground floor. There is also a collection of well parapets, vases, amphora, columns and sculptures of incalculable worth. On the upper floor you can visit the residences previously inhabited by the Countess and her descendants, up to only a few years ago; extremely well-preserved, they are today filled with ornaments and furniture from all over the world, priceless artwork by Van Dyke, Bruegel, Alonso Cano, among others, as well as collections of porcelain and glass. €5 (ground floor only), €8 (both floors). 37.3903-5.98712 Casa de Pilatos, Plaza de Pilatos, 1, ☎ +34 954 22 52 98, fax: +34 954 21 90 12, e-mail: casapilatos@fundacionmedinaceli.org. Nov-Mar daily 09:00-18:00, Apr-Oct daily 09:00-19:00. A 16th-century palace and generally thought to be one of the best in the city. €8; free on Mondays after 13:00. 37.38639-5.9919413 Palacio Arzobispal (Archbishop's Palace), Plaza Virgen de los Reyes. It is in the historical section of the city and is home to various clergy and the Archbishop. On the outside you only can catch a glimpse of the patio but on the inside there are important works of art. Free. 37.38466-5.9930314 Archivo General de Indias (General Archive of the Indies), Avenida de la Constitución, 3, ☎ +34 954 50 05 28. 16 Sep – 15 Jun: M-F 08:00-15:00; 16 Jun – 15 Sep: M-F 08:00-14:30. This Renaissance building houses extensive archives relating to the Spanish conquest of the Americas, and is designated a UNESCO World Heritage Site. Included in the collection are the diaries of Columbus. The archive hosts rotating special exhibits. Free. 37.39342-5.991815 Metropol Parasol, Plaza de la Encarnación (bus 27/32, metro T1), ☎ +34 606 63 52 14. Su-Th 10:30-24:00, F Sa 10:30-01:00. A enormous wooden structure designed by German architect Jürgen Mayer-Hermann, inspired by the Cathedral of Seville and in the form of giant mushrooms. Known to locals as 'las setas' (the mushrooms), the structure covers the Central Market and the Antiquarium; the top level contains a restaurant and provides some of the best views of Seville. €3, free (children under 12/disabled/Seville residents). 37.39254-5.9999416 Museo de Bellas Artes, Plaza del Museo, 9, ☎ +34 955 542 942, fax: +34 955 542 148, e-mail: museobellasartessevilla.ccd@juntadeandalucia.es. 16 Sep – 31 May: Tu-Sa 10:00-20:30, Su and holidays 10:00-17:00; 1 Jun – 15 Sep: Tu-Sa 09:00-15:30, Su and holidays 10:00-17:00. Considered by some as the second most important fine arts museum in Spain after the Prado in Madrid. The museum building is a former mercy convent renewed in the 17th century and the fifteen exhibition rooms show a comprehensive picture of Sevillian art from the Gothic period to the early trends of the 20th century. The square just outside hosts an open-air art market on Sundays until around 13:30. Plenty of original paintings on local topics, although some not so interesting bits as well! €1.50; free for EU citizens. 37.3793-5.996817 Museo de Carruajes, Plaza de Cuba, 10, ☎ +34 954 27 26 04, fax: +34 954 27 29 95, e-mail: itb@rcea.net. 1 Sep – 15 Jun: M-Th 09:00-14:00 17:00-19:30, F 09:00-14:00; 16 Jun – 31 Aug: M-F 09:00-14:00. A small museum with carriages of various kinds. €3.60 (adults), €2.60 (children/students/seniors), free (EU citizens); free admission on Tuesdays. 37.37082-5.9870118 Museo Arqueológico de Sevilla (Seville Archeology Museum), Plaza de América, ☎ +34 955 12 06 32, fax: +34 955 12 05 89, e-mail: museoarqueologicosevilla.ccd@juntadeandalucia.es. 16 Sep – 31 May: Tu-Sa 10:00-20:30, Su and holidays 10:00-17:00; 1 Jun – 15 Sep: Tu-Sa 09:00-15:30, Su and holidays 10:00-17:00. It has one of the best collection of Roman-era artifacts in Spain, brought from nearby Italica. €1.50; free for EU citizens. 37.3932-5.991919 Museo Antiquarium, Plaza de la Encarnación (underground level of the Metropol Parasol), ☎ +34 955 471 581. Daily 11:00-14:00, 15:00-20:00. A museum with excavated Roman and Moorish remains, discovered during construction of the Metropol Parasol. €2. Flamenco is very popular in Spain and is not just for tourists; however finding the right place is hard. Poke around the neighbourhood of El Arenal, following the sounds of flamenco music to find a place. 37.38904-5.9912591 Museo del Baile Flamenco, Calle de Manuel Rojas Marcos, 3, ☎ +34 954 34 03 11. Daily 10:00-19:00 (museum), performances 19:00-20:00. Offers an experience for all the senses with ambiental music, videos, touch-screens and artifacts to be found in this 18th century building at the heart of the historical Barrio Santa Cruz. On Friday and Saturday evenings a spectacular show is hosted at a discounted price for visitors to the museum. Flamenco art and photography exhibitions are also on display and dance, singing, percussion and guitar lessons are offered. Museum: €10/8/6 (adults/seniors/children); performances: €20/14/12 (adults/seniors/children). 37.38631-5.988632 La Casa del Flamenco (Cultural Centre), Calle Ximénez de Enciso, 28, ☎ +34 955 02 99 99. Daily autumn/winter 19:30, spring/summer 21:00. A good spot to see real flamenco. €18. 37.38824-5.987363 La Carbonería, Calle Levíes, 18 (near the cathedral), ☎ +34 954 21 44 60. 21:30, 22:30, and 23:30 daily. Offers free flamenco shows nightly. Arrive early for good seats. Semana Santa. The sombre Easter week processions feature thousands of people and go on all week, a spectacular display of conspicuous Catholicism. 37.37111111-5.99754 Feria de Abril (Seville Fair). Also known as "Feria de Sevilla" - a release after the somberness of Semana Santa. To say this is a huge party would be an understatement. Most if not all of Seville takes a week's holiday and they plan for the fair months in advance. The fair is close to the river. It covers a huge area and contains hundreds of private and public casetas which are laid out to form streets. Casetas are small marquees and you can only get into the private ones if invited. The public ones are large but just as much fun. The day is naturally split in two and between noon and 20:00 the streets of the fair throng with horses as riders and carriages strut their stuff dressed in traditional Spanish robes. After 20:00 the streets are cleared and "Calle del Inferno" comes to life. This must be one of the best funfairs in Europe – it takes weeks to assemble and pack up. Experience traditional dress, flamenco dancing (and the "sevillanas", the traditional dance of the region of Seville), guitars, fino, great tapas and participants who dance with gusto and eat and drink the day and night away. 37.38598-5.998437 Plaza de Toros de la Real Maestranza (Bull ring), Paseo de Cristóbal Colón, 12, ☎ +34 954 22 45 77. Nov-Apr 09:30-19:00, May and Oct 09:30-20:00, Jun-Sep 09:30-23:00; on bull fighting days 09:30-15:00. Bullfighting is not a sport for all; those who are either squeamish or have convictions on animal welfare should stay clear, as the event concludes with the killing of the bulls. Failing that, a visit to the arena and the attached museum of bull-fighting is well worth the time. While it is not the largest, it is considered the most attractive bull arena in Spain due to its history. €7 (adults), €4 (seniors/students), €3 (children 7-11), free (children under 6); free on Mon 15:00-19:00. Take some Spanish classes or do activities in Spanish to get in touch with the locals. LaCasa Sevilla, ☎ +34 666 882 981, e-mail: contact@lacasasevilla.com. A fun way to learn and practice some Spanish while doing activities and exploring the city. Wander through an open-air market. Vendors in many parts of the city sell on the streets, but on Sunday, when everything else is closed, a few spots really fill up. One market is behind the Alcampo shopping center at Ronda del Tamarguillo on Avenida de la Paz (Bus lines 30, 36 from Prado de San Sebastian), but it is easily outdone by a large flea market, selling clothes, furniture, trash, books, shoes, CDs, food, tools, and probably everything else just northwest of Triana near Avenida Carlos III (off of the left-hand side of most tourist maps). Seville offers a wide variety of retail clothing, although generally at high prices. The main shopping district is home to all the big international and Spanish clothing lines (such as Zara who has at least 4 separate stores in Seville). The winding streets and alleyways of the Santa Cruz area (around the Cathedral) do a roaring trade in Spanish- and Andalusian-themed T-shirts and inexpensive flamenco dresses for little girls. The Corte Ingles (translated literally to "The English Cut") is a large chain of department stores throughout Spain selling clothes in the "American style". Seville, like most Andalusian destinations, is known for its tapas. "Tapa", while it is associated with certain dishes, is actually a size and many restaurants or bars will offer a tapa, ½ ración (half serving, although sometimes enough to make a meal) and ración (serving) of the same dish. There are many great tapas places around the foot of the cathedral in the center of town. You can't go wrong, simply order one of everything to find your favorite! Some typical tapas include tortilla española (potato omelet), pulpo gallego (Galician octopus), aceitunas (olives), patatas bravas (spicy potatoes), and queso manchego (sheep's milk cheese from the region of La Mancha in central Spain). Also be sure to try the jamón (ham), which you often see hanging above the bar. Most of the restaurants kitchens do not open before 20:30 in the evening. Though usually some easy to prepare meals are available before that time. As the quality of food is considered of a great importance in Seville, most local bars will have very good food at a low price. For a authentic and interesting meal, stop at one of the many bars, especially one which doesn't offer English menus (the prices are likely to be lower!). Some bars near the river, such as Pedalquivir and El Faro de Triana, offer a nice view but aren't as good of a deal in terms of the quality of the food. Another would be El Patio San Eloy (San Eloy 9, Sevilla) where the tapas can be a little hit and miss, but where the cool staggered seating steps, fabulous décor and fruity sangria; provide a wonderful respite from the heat of the day. A good deal can more easily be had at less characteristic places such as Sloppy Joe's Pizza Inn and Papasá. Do not eat the oranges from the trees on the street, they have been sprayed to stop birds and taste awful. If you're vegetarian, make sure you specify that you eat no fish or tuna as vegetarian only implies no flesh here. 37.38718-5.995661 Bodeguita Romero, Calle Harinas, 10, ☎ +34 954 229 556. Tu-F 09:00-17:00, 20:00-24:00; Sa 12:00-17:00, 20:00-24:00; Su 12:00-17:00. A classic neighbourhood bodega, very popular with locals and serving excellent tapas. Fez, San Esteban, 27, ☎ +34 954 537 779. 13:00-16:30, 19:00-00:00 daily. Authentic Moroccan food with a quiet atmosphere and friendly staff. All food is halal, and vegetarian and vegan options are available. M.A.S. and Dia. These are two very popular grocery stores and have everything you need for much less money than El Corte Ingles. Additionally, Dia has its own discount brand on a lot of items. Though they are closed on Sundays (like most everything else in Sevilla) they are found throughout the city and are very easily accessible. La Manzanilla off of Calle de Alphonse. the food is cheap and delicious; has tapas. Levies, Calle San José, 15, ☎ +34 954 225 096. M-Th 20:00-02:00, F-Su 20:00-03:00. Levies is a set of three restaurants in one small plaza, sharing table space and menus. The original Levies is a tapas restaurant with inexpensive jarras of sangria. The Taberna has a different menu and offers tapas as well as more Mexican-inspired dishes such as burritos and nachos. The third Levies is their wine and drinks bar. El Rinconcillo, The oldest tavern around, try the Espinacas con Garbanzos (spinach with chickpeas) and Salmorejo, while watching the witty bartenders running around and writing your bill on the bar in front of you with, get this, chalk. Rodilla. Rodilla is a great place to get lunch, they serve up sandwiches in the form of tapas. They have a large selection of sandwiches, fresh squeezed OJ, and great cafe con leche. There are two locations in Seville, one close to the cathedral and one just outside of the Barrio Santa Cruz area. Rodilla is inexpensive, and can also be a great option if you a vegetarian. Taberna Coloniales Plaza Cristo de Burgos 19. This tapas place is cozy and has only a few tables. Go there early to put your name on the board to get a table, then head inside for a couple of beers. Portions are large and food is very very good. Nice homemade desserts, too. Duo Tapas, Calle Calatrava, 10 (in the Alameda district), ☎ +34 955 238 572. 13:30-16:30, 20:30-00:00 daily. This bar offers a nice atmosphere and good food. The price is average and the size of the tapas is fair, but it may be crowded, so it's better not to go in a hurry, as you may need to wait for a table. The nightlife of Seville is fantastic; no other European city has so many bars per inhabitant than Seville. In summer go to Isla Cartuja and find out why the Spanish night doesn't stop before 7AM. There you can find plenty of open-air discothèques. Other nightlife spots include Calle Betis in Triana, La Alamede de Hércules, and Plaza Alfalfa. Don't miss Cervecería La Internacional, one of the best beer shops in Spain. More than 250 types of beer, wonderful tapas and good connections. It's in Calle Barcelona, 1 minute away from Plaza Nueva, near the Town Hall. However, do not get confused, it is international, meaning, not typically Sevillano. Accommodation prices change with the tourist seasons. High season is April, May, September & October, Semana Santa, and Feria; Mid Season is March & June. Visits are recommended in November. Prices are not too high and weather is neither too hot nor cold. For a more intimate experience on a budget, wander into Santa Cruz, the old Jewish Quarter and you will find wonderful "pensiones" offering comfy beds and typical courtyard views. B&B Naranjo, ☎ +34 954 22 58 40. Address: C/San Roque, 11 - Rooms from €35. Free breakfast. Internet corner & Wi-Fi. It is a typical Sevillian house, in this B&B you will find private rooms for up to 5 people in Andalusian traditional style, with bath, air conditioning, television, telephone, piped music, etc. Public parking is nearby at Plaza de Armas with discounts for clients. Oasis Backpackers' Hostel, Plaza Encarnacion 29 1/2, ☎ +34 954 293 777, e-mail: sevilla@hostelsoasis.com. The oldest backpackers' hostel in town. Breakfast, 24hs tea & coffee, welcome drink, a big personal locker, internet & wifi + patio, bar and big roof-top terrace with a small pool. Daily activities such as walking tours, Spanish classes, bar games- all for free as well. Beds from €15. 37.392582-5.998561 Oasis Backpackers' Palace Seville, Calle Almirante Ulloa 1, ☎ +34 954 227 731, e-mail: palace@hostelsoasis.com. Dorms in all sizes that came with up to 2 bathrooms per room, free lockers to put your backpack in and free linen. Roof-top terrace with chill-out bar to overlook Seville, guest kitchen, free breakfast and free internet/ wifi. Beds from €11. Sevilla Inn Backpackers Hostel, Angeles St. 11, ☎ +34 954 21 95 41, e-mail: booking@sevillabackpackers.es. Check-in: 13:00, check-out: 11:00. Breakfast included. Free Wi-Fi. Spacious terrace with views of the Giralda. Beds from €10. Traveler's Inn Seville Hostel, Augusto Placensia, 5 (Nearby San Isidoro Church, 50 meters far from Alfalfa Square), ☎ +34 954 21 67 24, e-mail: reservations@sevillabackpackers.es. Check-in: 13:00, check-out: 11:00. Old Jewish mansion, international staff. Breakfast included. Free Wi-Fi. Beds from €10. Triana Backpackers, C/Rodrigo de Triana 69, ☎ +34 954 45 99 60, e-mail: sevillatriana@gmail.com. Check-in: 13:00, check-out: 12:00. Aula tiled with painted ceramic tiles, and green plants among cozy sofas, it also has very nice roof terrace with hammocks. Rooms are pretty standard for a hostel with most rooms having iron bunk beds, safety boxes and rather crammed space. Free breakfast and 3 (slow) computers with internet access. It's 3 blocks up from the Guadalqevir river, in a nice neighbourhood with narrow streets and old houses. €14-21. Singular Apartments, C/ Escarpín 1, 2ª planta, Sevilla 41004, ☎ +34 954 21 01 02, e-mail: info@singularapartments.com. Check-in: 13:00, check-out: 12:00. Fully equipped apartments with large rooms and kitchens, also well suited for families or small groups. €15-25. Hotel Pasarela Sevilla, Avenida De La Borbolla, 11 41004 Sevilla, ☎ +34 954 415 511. Grupo Piramide. Between the Alcazar and the Indian Archives. A Group of four hotels named after artists. Each offers a slightly different form of accommodation, Hospederia Dalí, Hotel Zurbarán, Hostal Van Gogh, Hostal Picasso. (Hostal Van Gogh, double room with private bathroom, €50 in June). Hostal Callejón del Agua, Calle Corral del Rey, 23. It is on a quiet street corner in Santa Cruz, and offers many amenities of a smaller boutique hotel. All rooms in this classic hostal include air conditioning, television, internet access, with some including balconies. Around 5 minutes from the shopping district and Cathedral and Alcázar the convenience of the location plays a large part in the appeal. Hotel Abanico, Calle Aguilas, 17, ☎ +34 954213207. Free coffee-shop all day long. Typical Sevillian house from the 18th and 19th centuries, surrounded by the most important monuments of the city. It is a small Boutique-Hotel with 22 rooms in Andalusian traditional style, with private bath, hair dryer, amenities, air conditioning-heating, satellite TV, telephone, internet connection. Hotel Abril, ☎ +34 95 422 90 46, e-mail: info@hotelabril.com. Address C/Jerónimo Hernández, 20, in the historical and monumental centre of Seville, in a quiet street near Encarnacion Square and the Alameda. Free coffee-shop is offered all day long. Set in a typical Seville House. 20 traditional comfortable rooms, with a private bath, air conditioning, heating, television, telephone, safety locks. Continental buffet breakfast, internet corner and free Wi-Fi connection. Hotel Bellavista Sevilla, Avenida de Bellavista 153, ☎ +34 954 69 35 00, e-mail: info@hotelbellavistasevilla.com. It is in the residential area of ​​Bellavista, a 10 minute drive from the center of Seville. The hotel features 104 rooms fully equipped with air conditioning, LCD satellite TV, telephone and desk. The bathrooms are modern and equipped with hairdryer. There is wireless internet throughout the hotel. The hotel also has a café with outdoor terrace and a la carte restaurant, 24 hours reception, meeting rooms, outdoor pool with sundeck and private garage. Pets are allowed. Hotel Itaca, Calle Santillana, 5-7, ☎ +34 954 22 81 56, fax: +34 954 21 27 47, e-mail: sevilla@itacahoteles.com. Boutique hotel with rooms on three floors surrounding a skylit courtyard with Andalucian tiles. Quiet, attractive rooms. Wifi, satellite TV, hair drier, safe, refrigerator all provided. Roof top pool in season. Near the Parasol at Plaza de la Encarnación. Bars and restaurants at nearby Plaza Alfalfa. Hotel Monte Triana. Triana. A 10-minute walk from the Historic Quarter and the Cartuja Island, where Expo 1992 was held and where the current headquarters of several important companies and the Isla Mágica Theme Park are. Easy access to the main transport networks: San Pablo International Airport, Santa Justa Railway Station, and also the FIBES Convention and Congress Centre. 37.38563-5.98943 Hotel Murillo, Calle Lope de Rueda, 7, ☎ +34 954 21 60 95, fax: +34 954 21 96 16, e-mail: reservas@hotelmurillo.com. Check-in: 14:00, check-out: 07:00-11:00. In the Juderia, with friendly service. Free Wi-Fi throughout the building, self-service laundry facilities available. €40+/doubles (low season), including breakfast. NH Plaza de Armas, Marqués de Parada. Modern hotel in the centre of Seville. Swimming pool, Wi-Fi, meeting rooms and a restaurant. From €83. Viapol Hotel Balbino Marrón, 9, E-mail: nhviapol@nh-hotels.com, Tel: +34 95 4645254, Fax: +34 95 4646668 . Hotel is close to the ‘Nervión Plaza’ and ‘Los Arcos’ shopping centres. There are several other NH hotels - just ask at reception if this one is full. Eme Fusion Hotel, Calle Alemanes, 29. In the monumental, financial and trade heart of the city, within steps of the Giralda, EME offers a renewed view of the city of the Guadalquivir. Gran Melia Colon, Canalejas, 1. Facilities include spa, private garage, restaurants, bars and more. 37.38151-5.992734 Hotel Alfonso XIII, C/ San Fernando, 2, ☎ +34 954 917 000. Check-in: 15:00, check-out: 12:00. The most luxurious hotel in Seville, built for the Exposición in 1929, and with prices to match! Has an outdoor pool, fitness centre, sauna, onsite restaurant, and non-smoking rooms. Free Wi-Fi, public parking €22/day. Doubles €313+, breakfast included. 37.38922-5.993235 Hotel Las Casas de los Mercaderes, C/ Álvarez Quintero, 9-13, ☎ +34 955 136 211, fax: +34 955 136 008, e-mail: recepcion.mercaderes@aa-hoteles.com. Check-in: after 14:00, check-out: before 12:00. The Hotel Casas de los Mercaderes is in the shopping area of the city centre, between San Francisco square and Salvador square next to the famous Sierpes and Tetuán streets. €116+. Hotel Villa de la Palmera. Avenida de la Palmera 57. This hotel is in an affluent section of Seville just outside center city. The hotel is a former private home of the Marquis and Marquise of Castilleja, built in the early 20th century and renovated for use as a hotel in 1999. Services and amenities include breakfast and room service, pool, gardens and a terrace, free parking and free Wi-Fi internet access. Las Casas de la Judería, Callejón Dos Hermanas, 7 (in Santa Cruz). A lovely old collection of houses beside a church that was once a synagogue. Rooms start at €150, prices less than this probably do not include breakfast. Rooms are often nothing special, apparently offers a pool. Perhaps wander in for a look around at its court yards. San Gil Hotel, C/ Parras, 28. In the center of the city. A converted palace dating back to 1901, the hotel San Gil is listed as one of the hundred best buildings in Seville. Positioned in the Old Quarter of the city it has 61 rooms which include air-conditioning, phone, satellite TV, minibar and safe. There is a small rooftop pool and sun terrace with views, and a traditional style bar/coffee shop and adjacent breakfast room. Local administration runs a free (1 hr) internet cafe right next to the tourist office in the center. Alternatively, most coffee places and certain bars will have Internet connection free for customers. If the Internet connection is a priority, make sure you ask about it before sitting. Also, chains like McDonalds, Starbucks or Cafe de Indias offer Internet access. 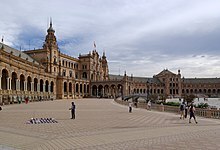 The Prado de San Sebastian bus station offers routes to other cities in Andalucía, including Córdoba, Granada, and Algeciras where it is possible to continue on by ferry to Morocco. A block from the station, on the meeting point of Avda. de Malaga nad Avd. de Cadiz you will find the Nuria Restaurant with wifi access if you have to wait for your bus. The Plaza de Armas bus station offers routes to other parts of Spain and other countries, most notably Portugal. From the bus station Plaza de Armas you can hop on the C4 Bus in order to get to Prado de San Sebastian - for the other direction choose C3. Lisbon. No direct rail link connects Seville with Lisbon, however a direct bus service exists , with advance web fares from €45 each way. The coach departs from Plaza de Armas bus station (platform 20/21 at 15:00) daily and the journey takes up to 7½ hours (including a 15- and 30-minute break). Sierra de Aracena. Towards the North West of Sevilla, it is one of the most famous places for Jamón in Spain and full of lovely small villages to discover. Great for walking around, eating and exploring this Natural Park. There are numerous buses from Plaza de Armas Bus Station. Sierra Norte. Towards the North of Sevilla, it makes for a nice change from the monotonous landscape of the Guadalquivir Valley. It is an area of steep relief, olive groves, and deep river valleys. Deer, wild boars and other large animals are often seen from the car. The area is well known for its cured meats. Cadiz. A wonderful, ancient (oldest city in Europe) city. It's an hour and a half by train, a little less by car. Walk its downtown, bathe at its beaches and taste its delicious fish. And if it's Carnival time, don't miss one of the more massive Carnival celebrations in the world (and surely one of the funniest too). Huelva. Discovering a 19th-century British town in the middle of this Andalusian city is definitely remarkable. Huelva has an interesting history. Columbus left from Puerto de Palos and La rabida Monastery, where he spent a few months it is well worth the visit. The wide and white beaches around, like Punta Umbria or Islantilla are also a good reason to visit and try fresh fish. Buses from Damas Bus Company every hour from Plaza de Armas Bus Station. Italica. A partially excavated Roman city, only a brief bus ride from Seville on the M-172 (from Plaza de Armas Bus Station). Most of it is lost under the village of Santiponce, but several streets and the footings of houses and public buildings with mosaic tiled floors can be seen. The highlight is one of the largest known Roman amphitheaters with seats for 25,000. For a longer trip, Madrid is 2½ hours from Seville using the AVE from the Santa Justa Train Station at the end of Avenida de Kansas City. This city travel guide to Seville has guide status. It has a variety of good, quality information including hotels, restaurants, attractions and travel details. Please contribute and help us make it a star!